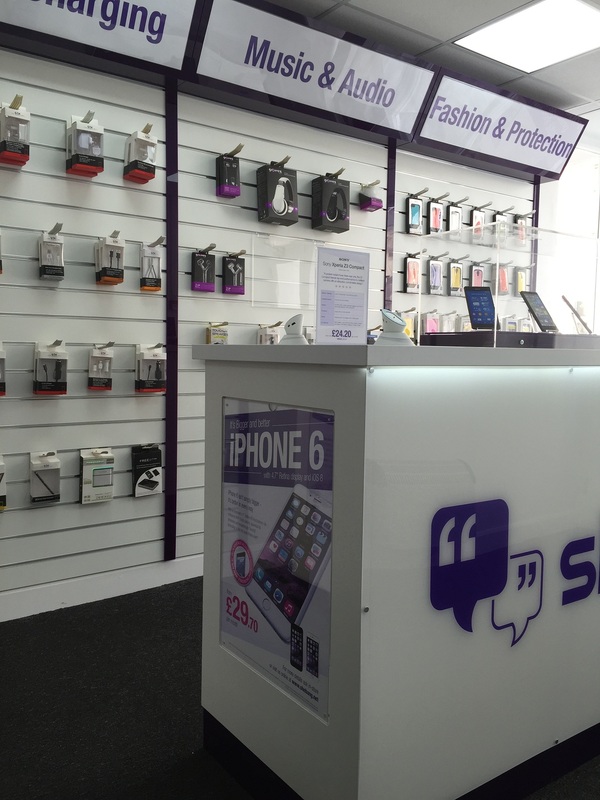 Shebang has over 20 years experience in the mobile phone industry covering all aspects of mobile phone sales and distribution and are the third largest independent mobile phone retail chain in the UK. They decided to continue to challenge the sector’s largest retailers by establishing a network of retail shops. With tight budgets and fast turnarounds required, Shebang asked Wrights Plastics for help. For our first venture in the complete fit out a retail shell we developed a flexible and cost-effective modular pod system. A single pod can be used as a base for a display unit. 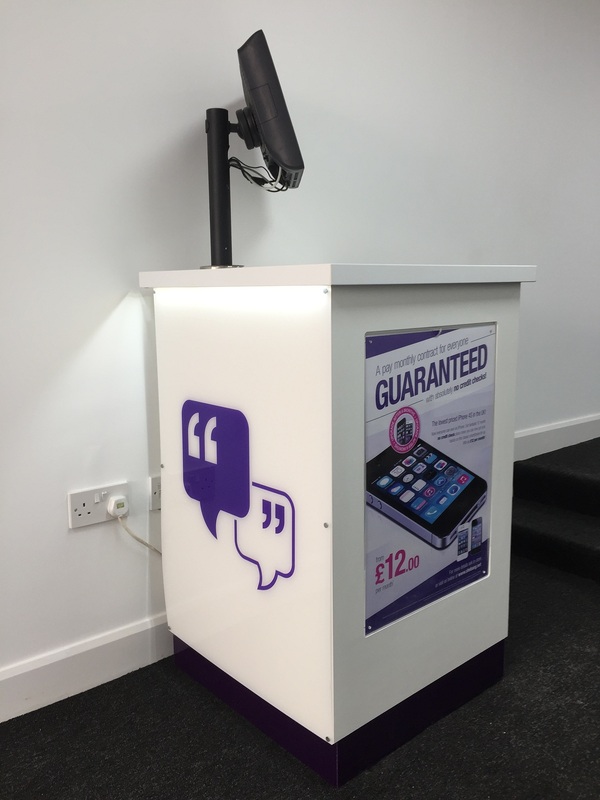 Two pods became a sales desk, whilst three became a fully branded central display unit. The modular system ensured we could make the most of available space regardless of the layout of the unit. Fitting out could be completed in hours, not days. Displays can be moved about to maintain interest or support promotional activities. We incorporated off-the-shelf retail display products such as illuminated display cabinets, mobile phone display cradles, slatwall poster holders and display shelves etc. With our in-house graphics team we created branded header boxes and display graphics throughout the stores. Using our flexible lightweight modular pods meant there was no need for costly installation teams. Where power was needed for tills and displays, the pods were located close to power sockets – it really was a case of plug and go! The system meant that a complete fit out from shell was completed in hours, not days without any compromise on the layout or look of the store. 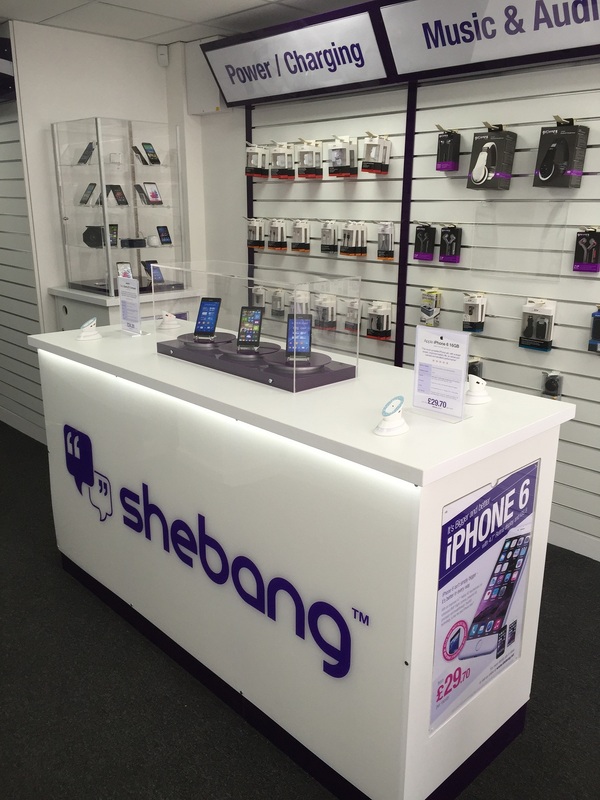 Shebang has over 20 years experience in the mobile phone industry covering all aspects of mobile phone sales and distribution and are the third largest independent mobile phone retail chain in the UK. We incorporated off-the-shelf retail display products such as illuminated display cabinets, mobile phone display cradles, slatwall poster holders and display shelves etc. We developed a flexible and cost-effective modular pod system. A single pod can be used as a base for a display unit. 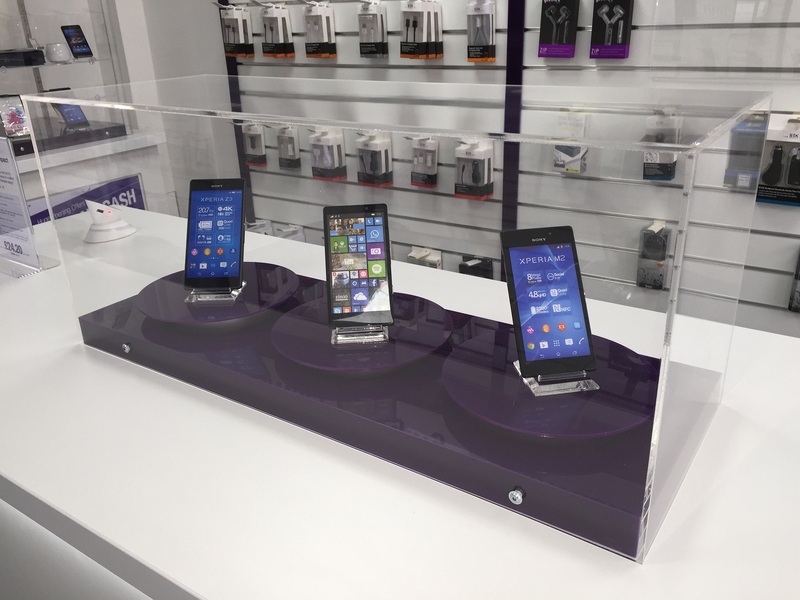 Two pods became a sales desk, whilst three became a fully branded central display unit. Our system and design meant that a complete fit out from shell was completed in hours, not days without any compromise on the layout or look of the store.